If we had to pick one reason why Italian chef Massimo Bottura is one of the most prolific chefs of our generation, it is because he's not afraid to innovate. As the chef-patron of three-Michelin-starred restaurant, Osteria Francescana (which was also crowned the World’s Best Restaurant in 2016 and 2018), he has garnered both praise and ire from critics throughout his career with his brand of “extreme Italian cuisine filtered through a contemporary mind”. At the recent masterclass organised by American Express exclusively for its Platinum Card members, he says that “twenty five years ago, they wanted me crucified at the piazza for playing with my grandmother’s recipes”. In Italy, he explains, there’s an unspoken rule of not messing with your nonna’s recipes, the Pope and football. But that didn’t stop him from experimenting in the kitchen. In fact, it eventually led to creations such as the “five ages and textures of Parmigiano Reggiano”, which was voted the Italian Dish of the Decade in 2011 by the Italian Gastronomic Conference. "Through food, you eat the mind of a chef… and understand the creative process. My pasta dish is a reflection of my memories as a child; every weekend, my grandma would make a big batch of lasagne and my brothers and I would always fight over the crunchy bits. Tapping into these thoughts, we transformed the spaghetti into the crunchy part of the lasagne by making (the dough) into thin sheets, and dehydrating, frying and baking them in an oven to come up with something amazing. "There’s no such thing as spaghetti alla Bolognese… this is one of the things I hate the most because it doesn’t exist in Italy; spaghetti is from the south of Italy while Bolognese is from the north, where I’m from." "You don’t need to understand what we’re doing in the restaurant… but you need to understand our obsession with quality. For example, we had to serve suckling pig one time, and the way I wanted to cook it was not perfect with the 11kg pig offered to me. I needed it to be 20kg, and 90 per cent of the pig farmers told me it was impossible. But there was one who offered a solution… raised the piglet with more milk than usual to reach my desired weight." 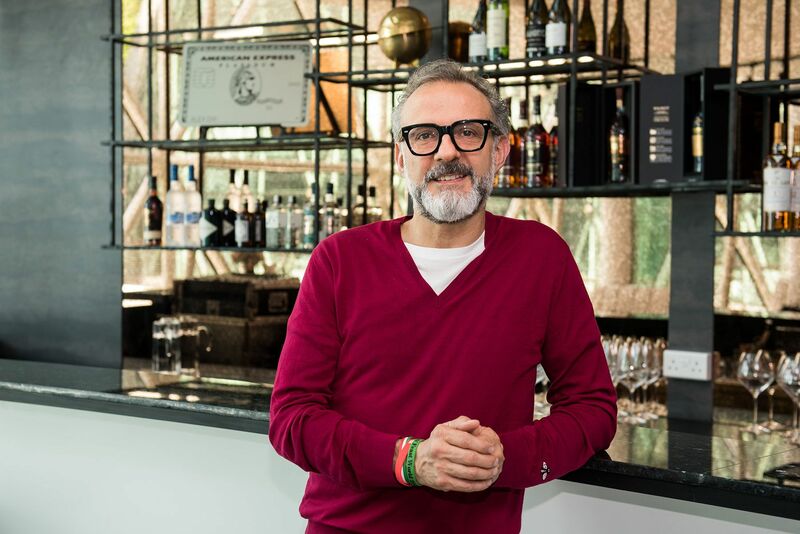 What's Keeping Massimo Bottura Busy? "Inspiration can come from everywhere… it can be through walking on the street with the trees in bloom or sitting in a room. It’s all about passion through which you transfer emotions. It’s not like 5pm to 7pm is creativity time, and 7pm to 9pm is service time. Creativity is creativity." "Technique is extremely important in contemporary cuisine... to transform ingredients into beautiful dishes, and not to feed the ego of a chef." "Mistakes happen… but it’s all about recreating in a perfect way the imperfections. It was our last dinner service and my sous chef Taka (Kondo Takahiko) was preparing the sweet-savoury lemon tart with oregano, capers, almonds and spices for our last two customers. He dropped one of the tarts, and I saw his face turn as white as my chef’s uniform while holding a knife in one hand, and the perfect tart in the other. We all thought that he was going to kill himself (he didn’t). So we created the other one exactly like the broken one, which became 'Oops! I dropped the lemon tart'." "It’s all about teamwork… and the reason why we keep evolving is because we have an extremely focused team of 60 people. If it’s always me, me, me, then you won’t go anywhere." "Cooking is an act of love… otherwise you can just prepare food that is cheaper and serve it." "Learn to be an ambassador of sustainable way of cooking… when we cook for 30 diners who come from all over the world, we give them the most amazing experience, starting with ingredients such as tomatoes, veal or foie gras. There’s a lot of leftover; you can decide to throw them out or work with those and create the staff meal." "We are not artists, we are artisans… artists are free to do whatever they want, from constructing magnificent buildings to fast Ferrari cars. For us, we have to create good food."